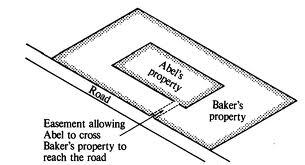 What is the difference between Right-of-Way and Easements? Locating right-of-ways and easements that affect your property is when data is gathered and a definable property boundary is created. Property Easements and Right-of-Ways are located and added to the property boundary drawing. The information shows many things such as ingress and egress access of roads, utilities, waterlines, where improvements would be best located etc. It is always a good idea to know where easements and right-of-ways are to avoid future problems when building improvements. • Know where you can place utilities such as electric, gas etc. • Locate definable boundary for ingress and egress, utilities, roads, pipelines, waterlines, sewer lines, electric lines in relation to your property.